I found a battered old copy of Cue for Treason: A Tale of Shakespearian England by Geoffrey Trease in my school library when I was 14 years old. In those days I eschewed any books that looked glossy and new, preferring instead the obscure monochromatic clothbound hard covers with titles such as The Everlasting Tapesty or The Knight's Chalice. Although I have very few memories from that first reading, the enjoyment I experienced stayed with me all these years, for when I found a similarly battered copy at a charity shop this summer I picked it up hoping to share it with my 11-year old. This morning we bombed through the last third of the book, unable to put it down until we knew the final fate of Peter Brownrigg and Kit Kirkstone. 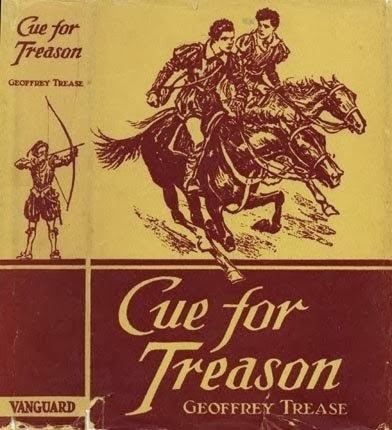 Cue for Treason is Geoffrey Trease's nineteenth published work - an astounding accomplishment when considering that it was published a mere six years after his first! 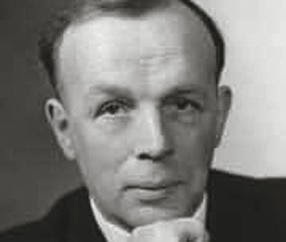 Publishing 113 in his lifetime, he was a prolific writer of fiction and nonfiction for both children and adults, along with his television and radio plays, biographies and autobiographies. He was fascinated by history, and combined meticulous research with adventure stories to bring events from different eras to life. Cue for Treason is an excellent introduction to Shakespearian England. Written to appeal to both boys and girls, with a realism unfamiliar in children's adventure stories at the time, it is unfortunate that Trease's work has not maintained enough of an audience to keep it in print. While certainly having a very linear plot, without figurative language or character depth, the writing has strengths which render any criticisms insignificant. True to its genre, it is replete with cliff-hangers and breathless near-misses that can at times defy belief, but there is never a sense that the author goes too far to work the plot around the action. Although Peter is definitely the protagonist, the inclusion of such a strong female character is refreshing, or Kit is anything but a prissy damsel in distress! Trease beautifully weaves the historically relevant information into the fabric of the story, creating a narrative of Living History. His evident concern with social justice permeates the novel without becoming moral pap. It's a sort of Famous Five or Hardy Boys for the Thinking Person.